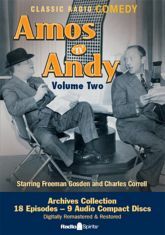 Freeman Gosden and Charles Correll are back as Amos Jones and Andy Brown, trying to maneuver their way around matters of engagement, employment, and enlistment. The Kingfish (also played by Gosden) figures prominently in the proceedings, ever straining the restraint of his wife, the sweet-but-straightforward Sapphire (Ernestine Wade), in 18 digitally remastered episodes from the 1950 - 51 season of the most popular radio show ever broadcast. Once again, these classic episodes are available from the Radio Spirits Archives Collection - featuring re-releases on CD of some of our most popular long-discontinued cassette collections.